The 11 July 2006 Mumbai train bombings were a series of seven bomb blasts that took place over a period of 11 minutes on the Suburban Railway in Mumbai, the capital of the Indian state of Maharashtra and the nation's financial capital. The bombs were set off in pressure cookers on trains plying on the suburban section of the Mumbai division of Western Railway. 209 people were killed and over 700 were injured. Map showing the 'Western line' and blast locations. Pressure cooker bombs were placed on trains on the western line of the suburban ("local") train network, which forms the backbone of the city's transport network. Pressure cookers were used in this bombing and other recent explosions to increase the afterburn in a thermobaric reaction, more powerful than conventional high explosives. The first blast reportedly took place at 18:24 IST (12:54 UTC), and the explosions continued for approximately eleven minutes, until 18:35, during the after-work rush hour. All the bombs had been placed in the first-class "general" compartments (as opposed to compartments reserved for women, called "ladies" compartments) of several trains running from Churchgate, the city-centre end of the western railway line, to the western suburbs of the city. They exploded at or in the near vicinity of the suburban railway stations of Matunga Road, Mahim, Bandra, Khar Road, Jogeshwari, Bhayandar and Borivali. Home Minister Shivraj Patil told reporters that authorities had "some" information an attack was coming, "but place and time was not known". The bomb attacks in Mumbai came hours after a series of grenade attacks in Srinagar, the largest city in the Indian state of Jammu and Kashmir. Home Secretary V K Duggal said there was no link between the Srinagar and Mumbai bomb blasts. 1 One bomb exploded at this location, but another one was found by police and defused. Maharashtra Deputy Chief Minister R. R. Patil confirmed that a total of 200 people were killed and another 714 others have been injured. Additionally, various news organisations have reported that at least 200 people have died and that more than 700 others have been injured. A week after the blasts in Mumbai the confirmed death toll rose to 207. In September 2006 it was confirmed that the death toll had risen to 209. A state of high alert was declared in India's major cities. Both the airports in Mumbai were placed on high alert. The western line of the Mumbai Suburban Railway network was at first shut down, although some trains resumed service later, and stringent security arrangements, including frisking and searching of commuters, were instituted on the other lines of the network. The city's bus service, the BEST, pressed extra buses into service to transport stranded commuters home. The Prime Minister also held a security meeting at his residence attended by Home Minister Shivraj Patil, National Security Advisor M K Narayanan, and Home Secretary V K Duggal. Western Railway services were restored on 11 July by 10.45 pm. As a show of investor confidence, the Bombay Stock Exchange rebounded, starting the day with the BSE Sensex Index up by nearly 1% in morning trade. Foreign investors also retained confidence, with the Sensex up almost 3% at 10,930.09 at the end of the day's trade. Initial rescue efforts were hampered by the heavy rains and the prevalent monsoon flooding, but quickly took momentum after fellow passengers and bystanders helped victims to reach waiting ambulances and/or provided first aid. Maharashtra Chief Minister Vilasrao Deshmukh announced ex-gratia payments of Rs 1,00,000 (approximately US$2,200) to the next of kin of those who died in the explosion. The injured would be given Rs 50,000 (approximately US$1,100) each. Indian Railways announced Rs 5,00,000 (approximately US$10,000) compensation and a job to the next of kin of those killed in the serial blasts in Mumbai. The announcements were made by Railways Minister Lalu Prasad Yadav after visiting those injured in the blasts at a hospital in Mumbai. However a study commissioned by former MP Kirit Somaiya noted that only 174 of the 1,077 victims had received compensation through the Railway Claims Tribunal. For the handicapped victims, only 15 out of 235 eligible cases had been taken care of. Regarding the Prime Minister's promise to India concerning the rehabilitation of the victims, L. K. Advani noted that "none of the above mentioned assurances has been fulfilled to any degree of satisfaction"
Due to the mobile phone networks being jammed, news channels such as NDTV ran tickertapes with information of injured individuals as well as SMS messages from those who wished to contact their families. Reports indicated that at around 18:00 UTC on 11 July (midnight in Mumbai), the phone networks were restoring service; telephone service was completely restored during the night. Mumbai Help, a blog run by around thirty bloggers, was a useful source of information, especially for those outside India. Some 350 people were detained 36 hours after the incident in Maharashtra — police claim that these are people rounded up for investigations. On 14 July, Lashkar-e-Qahhar, a terrorist organisation possibly linked to Lashkar-e-Taiba (LeT), claimed responsibility for the bombings. In an e-mail to an Indian TV channel, the outfit says it organised the bombings using 16 people who are all "safe". According to the e-mail, the main motive seems to have been a retaliation to the situation in the Gujarat and Kashmir regions, possibly referring to the alleged oppression of Muslim minorities in certain parts of the region. It also says that the blasts were part of a series of attacks aimed at other sites such as the Mumbai international airport, Gateway of India, the Taj Mahal in Agra and the Red Fort in New Delhi. The authorities are investigating this claim and are trying to track the location of the e-mail sender. However, on 17 July, the forensic science laboratory Mumbai has confirmed the use of a mixture of the highly explosive RDX and Ammonium Nitrate for the bombings. The presence of these explosives in the post explosive debris was confirmed by modern techniques such as Liquid Chromatography with mass detector (LCMS), Gas Chromatography with mass detector (GCMS) and Ion Scan Chromatography. They have indicated a strong possibility of all explosives being planted at the Churchgate railway station, which was the starting point for all affected trains. Initially, religious extremists from the Lashkar-e-Taiba and the banned Students Islamic Movement of India terrorist groups, and Pakistan's intelligence agency ISI were the prime suspects. Both Lashkar and SIMI denied responsibility for the bombings. There was also evidence about the involvement of the international Islamic terrorist group Al-Qaeda following a phone call from a man claiming to be a spokesperson for the group on 13 July. The alleged al-Qaeda spokesman had said the blasts were a "consequence of Indian oppression and suppression of minorities, particularly Muslims." On 30 September 2006, CNN reported that "The Indian government accused Pakistan's military spy agency, the Inter-Services Intelligence, of planning the 11 July Mumbai train bombings that killed 209 people". On 21 July 2006, police arrested three people suspected to be involved in the bombings. Police have detained more than 300 suspects since 18 July but these are the first arrests in the case. Two of the men were detained on Thursday in the northern state of Bihar and the third later in Mumbai. All three are said to belong to the banned SIMI organisation. On the same day, Abdul Karim Tunda was thought to be arrested in Mombasa, Kenya on suspicions of involvement in the train bombings. but it was the wrong person. He was one of India's most wanted men and also a suspected organiser for the banned Islamic terrorist group Lashkar-e-Taiba. He was arrested in 2013 near the Nepal border. In late 2006, all the seven key accused in the Mumbai train blasts in July retracted their alleged confession to the police, saying they were illegally forced to sign blank papers, an Indian TV channel reported. M K Narayanan, the Indian National Security Advisor, has said that India doesn't have "clinching" evidence of the involvement of ISI in the Mumbai train blasts of 11 July. "I would hesitate to say we have clinching evidence but we have pretty good evidence," he was quoted as saying on CNN-IBN. Following Narayanan's remarks, the Union Home Secretary V.K. Duggal on Monday characterised the evidence as "very good [...] it is fairly solid evidence,". 5 On 25 September 2008, Hindustan Times reported that "the Crime branch also learnt that the men [behind 2008 Delhi bombings] are those very operatives who had introduced themselves as Pakistanis to perpetrators of 11 July 2006 Mumbai train bombings. Jemaah Islamiyah is known to use pressure cooker bombs with RDX and like explosives with taggants. Note that Jemaah Islamiyah had operatives in the Pakistan areas active in religious indoctrination and that were working with Egyptian Islamic Jihad through al-Zawahiri who taught on the use of pressure cooker bombs. As such it is quite possible that Jemaah Islamiyah was involved in the attack possibly through Indian Mujahideen which it also forms part of. Note that Jemaah Islamiyah was behind the 9-11 anthrax attacks as well. On 27 February 2009, Sadiq Sheikh, an arrested leader of the Indian Mujahideen confessed to his alleged role in the bombings in a news channel broadcast. He claimed to have engineered the pressure cooker bombs with his associates in a flat in central Mumbai. If verified, these allegations could invalidate the previous claims by the ATS that the ISI or the SIMI were involved. Sadiq states in his confession, ‘‘All five of us arranged local first class train passes beforehand. We also had the local train time table with us so that we could choose a train as per our convenience. We purchased bags and pressure cookers in Bombay.’’ He also claimed to have misled investigators by blaming the attacks on the Al-Qaeda. On 6 April 2013, IM co-founder Sadiq Sheikh declared hostile witness by defence advocates. In September 2015, 12 people were convicted in this case. On 30 September 2015, a special Maharashtra Control of Organised Crime Act (MCOCA) court sentenced to death Faisal Sheikh, Asif Khan, Kamal Ansari, Ehtesham Sidduqui and Naveed Khan who planted the bombs in various trains. The other seven convicts—Mohammed Sajid Ansari, who prepared the electrical circuits for the bombs, Mohammed Ali, who provided his Govandi residence to make the bombs, Dr Tanveer Ansari, one of the conspirators, and Majid Shafi, Muzzammil Shaikh, Sohail Shaikh and Zamir Shaikh who provided logistical support – were sentenced to life. In wake of the blasts, the Indian government tightened security in railway stations. Under new restrictions passed by the Ministry of Railways, non-passengers would no longer be allowed on the railway platforms after July 2006. Other major security steps include installation of close circuit televisions inside the stations for round-the-clock vigil and installation of metal detectors. Various senior political figures from India and around the world condemned the attacks. In India, Prime Minister Dr. Manmohan Singh was quick to call for calm in Mumbai, while President Dr. A. P. J. Abdul Kalam, Railways Minister Lalu Prasad Yadav, and president of the Indian National Congress Sonia Gandhi also issued statements regarding the bombings in Mumbai. Officials from other nations offered their condolences to those affected by the bombings. Officials, from Pakistan which has long feuded with India, and the United Kingdom, which was the target of similar attacks the previous July, were among those who denounced the attacks in Mumbai as well as terrorism as a whole. Several terrorist groups, including Lashkar-e-Toiba and al-Qaeda, made comments — both in condemnation and condonation — about the attacks as well. A memorial service was held in Mumbai on 18 July at 6:25 pm local time — exactly one week after the blasts. President Abdul Kalam, his hand raised to his forehead in salute, led the two-minute silence as people lit candles and placed wreaths at Mahim station, one of the seven places on the suburban rail network hit by bombs. Sirens sounded across Mumbai marking the memorial service. People gathered at the site of the blasts, in railway stations on the city's Western Line, traffic came to a halt, It interrupted films and observed a moment of silence to pay homage to the victims. The incidents that followed the bombings were used as details in the plot of the film, A Wednesday! (2008) starring Naseeruddin Shah, which was inspired by the train bombings. The Hindi film Mumbai Meri Jaan (2009), which won multiple Filmfare Awards, deals with the aftermath of the Mumbai train bombings. The movie The Train is a 2011 Malayalam thriller based on the bombings. Mumbai serial train blasts investigations- The official police investigations into the blasts. ^ "Gaffar bomb was in pressure cooker". Hindustan Times. India. 23 September 2008. Archived from the original on 24 December 2008. Retrieved 3 January 2011. ^ "Notes from the Technology Underground: Pressure Cooker Bombs". Nfttu.blogspot.com. 14 March 2006. Retrieved 3 January 2011. ^ "Suspected pressure cooker bomb found near CM's public meeting venue". News.webindia123.com. 24 September 2008. Retrieved 3 January 2011. ^ "Bomb Prevention". Acfnewsource.org. 31 December 2006. Archived from the original on 27 September 2006. Retrieved 3 January 2011. ^ a b "At least 174 killed in Indian train blasts". CNN. 10 July 2006. Archived from the original on 11 July 2006. Retrieved 11 July 2006. ^ "Blasts rock Mumbai rail network". news.bbc.co.uk. 10 July 2006. Archived from the original on 13 July 2006. Retrieved 11 July 2006. ^ "Tuesday terror: Six blasts rock Mumbai railway stations". Times of India. India. 10 July 2006. Archived from the original on 25 January 2007. Retrieved 11 July 2006. ^ "Scores dead in Mumbai train bombs". news.bbc.co.uk. 10 July 2006. Archived from the original on 13 July 2006. Retrieved 11 July 2006. ^ a b "Serial blasts rock Mumbai, 172 killed". ndtv.com. 11 July 2006. Archived from the original on 21 July 2006. Retrieved 11 July 2006. ^ "Death Toll at 209". CNN. 30 September 2006. Retrieved 30 September 2006. ^ "Death Toll at 200 in India Train Bombings". BBC News. 11 July 2006. Archived from the original on 14 July 2006. Retrieved 11 July 2006. ^ "'Everything was blacked out': Mumbai blast survivor". CBC News. 12 July 2006. Retrieved 12 July 2006. ^ "Mumbai Death Toll Tops 200". CBS News. 11 July 2006. Archived from the original on 12 August 2006. Retrieved 11 July 2006. ^ "Mumbai Terror Death Toll at 200". CTV. 11 July 2006. Archived from the original on 15 July 2006. Retrieved 11 July 2006. ^ "Mumbai remembers train bombing victims". CTV. 21 July 2006. Retrieved 24 July 2006. ^ a b CNN (30 September 2006). "Pakistan spy agency behind Mumbai bombings". CNN. Retrieved 30 September 2006. ^ "India's Commercial Hub Mumbai Rocked by 5 Explosions". bloomberg.com. 11 July 2006. Archived from the original on 21 July 2006. Retrieved 11 July 2006. ^ "PM reviews security situation after blasts". NDTV. Archived from the original on 20 July 2006. Retrieved 12 July 2006. ^ "Mumbai back on track". The Hindu. Chennai, India. 13 July 2006. Archived from the original on 21 July 2006. Retrieved 13 July 2006. ^ "Lalu offers Rs. 5 lakh, railway job to kin of dead". The Hindu. Chennai, India. 12 July 2006. Archived from the original on 17 July 2006. Retrieved 12 July 2006. ^ "Mumbai Blasts". NDTV. 11 July 2006. Archived from the original on 20 July 2006. Retrieved 11 July 2006. ^ "350 rounded up in Maharashtra". The Tribune. India. Archived from the original on 17 July 2006. Retrieved 14 July 2006. ^ TNN (12 July 2006). ""LeT, SIMI hand in Mumbai blasts" ''Times of India''". The Times of India. Retrieved 3 January 2011. ^ "Manmohan warns Pak: Stop terror". The Indian Express. India. Archived from the original on 17 July 2006. Retrieved 14 July 2006. ^ "Police raids seek Mumbai bombers". BBC. 12 July 2006. Archived from the original on 14 July 2006. Retrieved 12 July 2006. ^ "SIMI involved in Mumbai blasts: Home Ministry". ndtv.com. 12 July 2006. Archived from the original on 26 September 2007. Retrieved 12 July 2006. ^ "First arrests in Mumbai bombings". BBC News. 21 July 2006. Retrieved 12 September 2006. ^ Kumar, Hari (21 July 2006). "3 Arrested in Mumbai Train Bombings". New York Times. Retrieved 13 September 2006. ^ Gentleman, Amelia (21 July 2006). "Police arrest 4 suspects in Mumbai train attacks". IHT. Retrieved 13 September 2006. ^ "Man arrested in Kenya over Mumbai bombings". ABC News. 22 July 2006. Archived from the original on 9 December 2007. Retrieved 13 September 2006. ^ "Delhi bomber arrested in Kenya". Times of India. India. 22 July 2006. Retrieved 13 September 2006. ^ Ahmed, Zubair (10 October 2006). "Bomb suspects retract confessions". BBC News. Retrieved 18 April 2010. ^ "Police claim to have arrested 5 key members of IM". Hindustan Times. India. 25 September 2008. Archived from the original on 5 October 2008. ^ Hafeez, Mateen (27 February 2009). "Involvement of Sadiq Sheikh". The Times of India. India. Archived from the original on 3 March 2009. Retrieved 28 February 2009. ^ 2006 train blast case: IM co-founder Sadiq Sheikh declared hostile witness. Ibnlive.in.com (2013-04-06). Retrieved on 2013-08-17. ^ "Mumbai blasts 2006: India court finds 12 men guilty". BBC News. 11 September 2015. Retrieved 27 February 2017. ^ "2006 Mumbai blast case: 5 sentenced to death, 7 get life term". news.biharprabha.com. ANI. 30 September 2015. Retrieved 30 September 2015. ^ "Mumbai train blasts: Death for five for 2006 bombings". BBC News. 30 September 2015. Retrieved 27 February 2017. ^ Najar, Nida (11 September 2015). 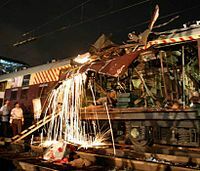 "Indian Court Convicts 12 in 2006 Bombings of Mumbai Trains". New York Times. Retrieved 12 September 2015. ^ "Neeraj Pandey taking it easy after A Wednesday". Hindustan Times. India. 25 September 2008. Archived from the original on 9 February 2011. Retrieved 28 September 2011. ^ "Terror inspires Bollywood again". The Indian Express. India. 9 July 2008. Archived from the original on 22 March 2009. Retrieved 15 November 2009. Wikimedia Commons has media related to 11 July 2006 Mumbai train bombings. Flickr photo compilation by Mumbai resident and writer Jeffrey Rufus[permanent dead link] See also publication mention in the India Times.